Sounds impossible right? I thought so to up until about a week or so ago, when I found out that it CAN be done. 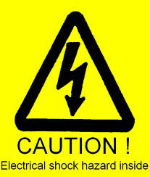 Like Obama said back in 2008..."Yes We Can"...get Electrical inspected and permits after developement. I'm not sure what your scenario is, I hope that if you are developing your basement that you are pulling your permits prior to the work being completed. If you are looking at purchasing a home that already has a finished basement but no electrical inspection then this post and video below is for you. Electrical inspections on finished basements are not impossible, there are companies in Calgary that will do the inspection after the fact without destroying the finished basement....too badly!